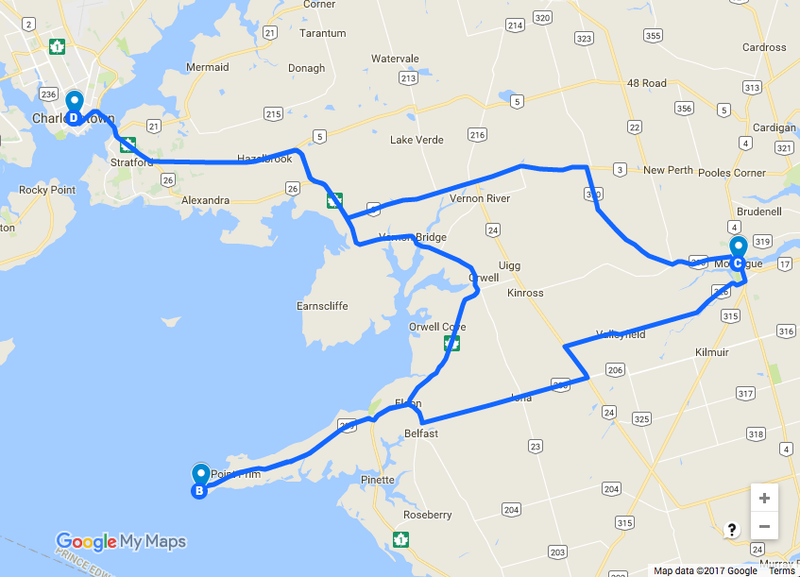 In which we do a classic Sunday Afternoon ride out to Point Prim then to the closest Tim Horton's because we could, and flirt briefly with the idea of running out of gas, but opt not to this time out. A friend of mine is scheduled to take her motorcycle permit road test later this week, and I offered to go out riding with her on Sunday afternoon and offer her some advice such as "Try to keep it going in the direction you want it to" and "If in danger or in doubt, a little throttle will get you out" and other useful nuggets that I've picked up over the years. As all good rides start, in the parking lot of a Tim Horton's just by the bridge into Stratford and once I'd downed my tea and agreed that "Yes, it is a warm day to be wearing leathers. ", and we were off! Just to keep things entertaining, the last kilometre to the lighthouse is gravel, as is the parking lot on the way there. Definitely something to keep in mind if you are not happy riding on it. So we had some time to kill, and headed off to Montague to practice riding a roundabout or two. They can be so much fun, but for a new rider a tricky to in order to coordinate clutch controls and timing for entering as well as the corner itself as it quickly turns into more of a chicane or "S" curve for the rider, with curbs upsetting the unwary. On our way back to the Trans Canada, Pauline hit reserve and ended up on the side of the road while I was a bit further ahead and had to loop around and head back. The Suzuki Boulevard M40 aka Suzuki Savage has a tiny little tank of only 10.5 litres capacity, and she had overestimated how far she could ride on the remainder. A couple weeks ago my mate Zac hit reserve on his Savage, and ended up on the side of the road, and I had no wish to repeat this. We put another 19 kilometres on the tank after reserve, and made it into the gas station, thankfully. Back in Charlottetown we hit a parking lot that has a nice incline to fine tune her uphill starts, as she had a tendency to not give the bike enough gas when starting on a hill, and I took her two up around the lot to show her how I used lots of gas and clutch to do it, but I found there was play in her bars due to a loose clamp on her goose neck, something I'd never run across before. There was a 1/4 in gap where the surfaces should have mated! A 1/4" gap on the left makes these bars wiggle! 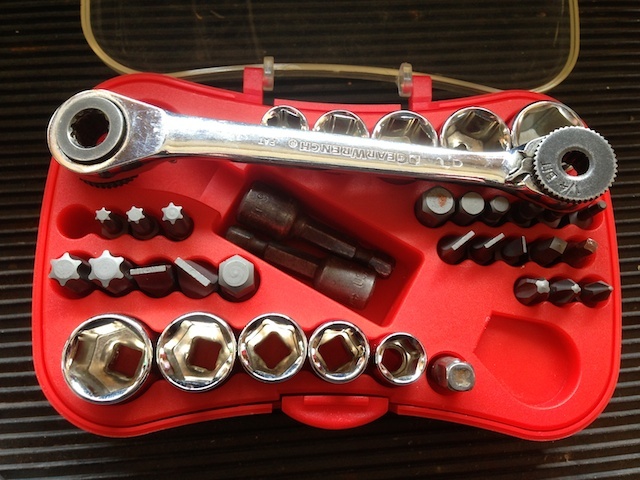 The bars had to come off so I could tighten the bolt with my underseat tool kit (non OEM mini ratchet to the rescue!) courtesy of my Gearwrench mini ratchet and some metric hex bits. Once we had everything tightened back up she worked on her throttle and clutch control and improved quite a bit in short order. Now I've got you, you pesky little blighter! And with that we headed our separate ways. All told about three hours of riding on a fabulous Sunday afternoon. P.S. That Gear Wrench Microdriver set is the bomb for motorcycle toolkits provided you replace the hex bits (SAE) with Metric hex bits. 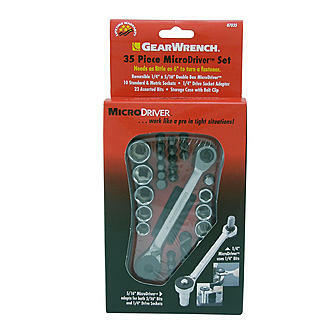 Sold at Lowes in Canada as a kit for under $30, when I take only the parts needed fits quite well under the seat of my motorcycle. The ratchet is strong enough to drop the forks out of the triple trees, but you will want to be wearing your riding gloves if you use that much force on that tiny little handle! I've seen them in Lowes in Canada, and they sell them at Walmart and Sears in the U.S.
Pauline sent me a text this afternoon to say that she had passed her test for her motorcycle license! Congratulations! I'm guilty of saving the best part for the last. 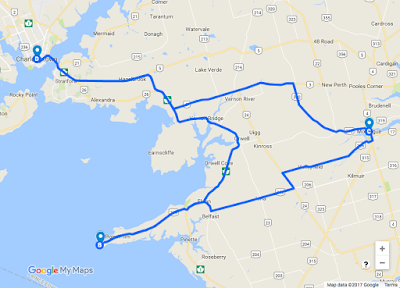 So sue me, but as I was looking at the shots, it turns out that I crammed most of the ride into Day 4, a very busy one from the moment I let out the clutch at Mira River Provincial Park and headed down the highway for Fortress Louisbourg. Before you think less of me for such a short trip to one of Canada's famous historical sites, let me first say that I'd visited the Fortress back in 2011 when Darlooney and I had just gotten off of the Newfoundland ferry in Sydney NS back from our trip across the Trans Labrador Highway. 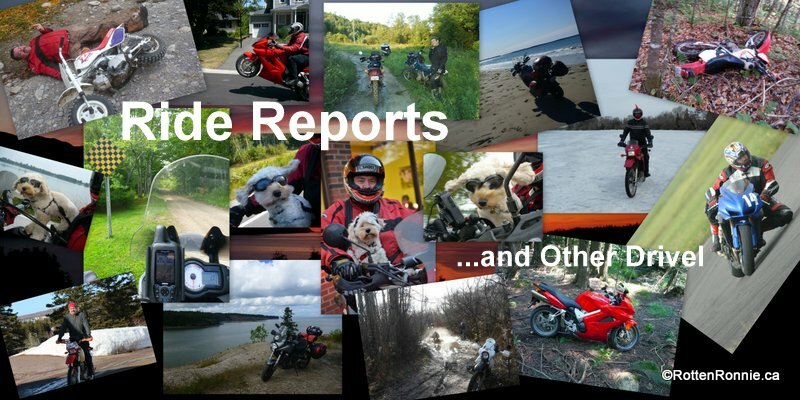 We spent most of the day there, I got a number of photographs (too many really, but that is how I roll), and shared them in my ride report "I Survived the Trans Labrador Highway". As you approach the present town that is there today, you should look at the bush on each side of road, and wonder how the early settlers ever managed to push their way through it. Dense growth of pine trees and brush forbid any direct access, so waterways and game trails would have been the highway of the day. In fact, most of the travel of the period was done via water, and Fortress Louisbourg became a mercantile hub of the New World, shipping an estimated 31 million tonnes of salt fish per year. I had to double check that figure as I thought I had misheard the guide. The visit was free as it is Canada's 150th birthday this year, so all National park admissions are free, so after waking up far too early, I sat in the parking lot and chatted with the other visitors while waiting for the attraction to open up. The line up needed three shuttle buses to get us to the Fortress, but once there you head out on foot along it's gravel pathways. It's not terribly accessible, so if you have a stroller or wheelchair, you may want to opt for the large "rough terrain" type of wheels, and you should be fine. The fortress is only 1/4 restored, as much of the stone from the ruins was carted off to serve as foundation material for local homes, but it's very impressive. I had to look this up... A fort protects a harbour or a town. A fortress encloses the town. English settlements were completely different as settlers were encouraged to clear the cultivate the land as soon as possible to form a tax base for the new colony, whereas this French settlement was a commercial crown enterprise, and people were forbidden to colonize the surrounding area. One would have thought to see a town grow up on the outside, with farms, orchards, wharves etc, but all the food, fodder and hard goods were imported from France or it's colonies. All of it. They were not even allowed vegetable gardens from my understanding, all to make them completely reliant upon the largess of the French crown. They did supplement their food stocks with the aid of the local Mic Mauq indians, chiefly caribou meat. Can you guess what this is? Located next to the gatehouse. Can you spot the doe and fawn in the field centre top? The view from the battlements towards the present day town. Does anyone want to photoshop out the tourist? I couldn't help but think how much longer I wanted to stay, yet how far I had to go to get to Meat Cove off of the Cabot Trail. I caught a shuttle bus and headed back to the bike and let out the clutch bound for Glace Bay. Look at the map and note that I totally messed up. I should have headed further East before heading north in order to see more of the coast line to the east of Glace Bay, but that mistake combined with significant construction meant that I was kept back from the coast until much later on and I missed quite a bit of the Glace Bay area, so I've yet another "todo" added back to the Cape Breton Island list. To go? No thanks, I'll eat in. The approach into Sydney along the coast from Glace Bay was nice enough, but if I had known how busy the traffic would be, I would have happily avoided the whole mess and jumped onto the 105 bound for the Englishtown ferry. As I rolled past this diner, I couldn't help but think of my newf friend Tat2 and how we hit only the best of Newfoundlands little gems while riding in that province. I had visions of Crush Pineapple and Spruce Beer as I opened the door to find that they served some of the best deep fried chicken I've had. If you like KFC and salt, you will love this chicken! The fries, not so much. Hahaha. Fellow Cabot Trail riders leaving the ferry. There really is only a short delay at the ferry, and passage is only $7 CDN. I've been on this one before, but never heading in this direction.Traffic crossing in my direction was light, with only a pickup truck ahead of me, but I've seen this road on a weekend in July, and it can get awfully busy, especially with RVs and trailers trying to carefully ascend the passes, and even more carefully trying to descend the other side under brakes almost the entire way down. I was determined to get ahead by passing safely, but ahead of this lot I wanted to be. A mid-summer weekday wasn't so bad, not so bad at all, but there are always two ahead and three behind. This was a weekday, yet there was still enough slow cage traffic to hold us up, so the fella ahead and I passed given any safe opportunity, only to get held up in a few of the really interesting sections. This side was repaved not so many years ago, but we would run into some sections up ahead that have gravel bits cut through the pavement, about four feet wide with varying levels of ruts. I think I hit my rim on one of them. Oh no! These guys are going to be murder to pass! The Road to Capstick, and consequently, Meat Cove. Remember I told you that I almost made it the last time I was on the Cabot Trail, but as the bridge had been washed out, they posted a guy to turn tourists back and he was highly effective at his job. I need to do this on a scooter or a pit bike for fun and giggles. Right! I was now officially past the turn around point and was able to take new pictures of areas I'd never before seen! I found a little provincial park for a wee rest break, but it turned into more of a photo op instead. Can you relate? Meat Cove Rd looking back at Capstick I think. Whoops, not as far as Capstick yet! Disregard that caption. Post trip guessing. Thank god for a GPS camera! I'm so excited! I think I'm going to have to stop for another pee! Seven years in the making... "Did you get out to Meat Cove?" It's like a secret ADVRider passphrase or something. Nope. Not in the 11 years I've been riding through these parts. That's all gonna change baby! Thar she blows! That's it. Mowed lawns and tents. Paved down hill. Reminds me of Europe, but with steel guard rails, pretty straight and shorter. In fact, it's not much like the Alps at all, but it was fun. Another rider from Winnipeg that had rode a scooter there. Yep. Popped my balloon real fast, especially as I'd only had one step out and that because I'd used a bit too much throttle exiting a corner before the bike was fully straight. So I really should have pitched a tent and spent the night, but I was ready to push on and make some more ground before calling it a day, and I figured I could get into Cheticamp and sit down to a nice cuppa before dark if I got on the bike and got going. Time to get the lead out and get moving! I was much more confident on the way out as I knew that I only had to watch for oncoming traffic and a few nasty potholes on the first stretch of gravel, so I was able to take a few more pictures on the way back to the Cabot Trail. Cheers Meat Cove! It's been a slice! I think the most disappointing part was all the vehicles and tents, and the work you would have to do in order to get shots without all the man made clutter attached. To be frank, I was a bit disappointed and wanted to roll on out and get back to free wheelin'. Man, the camera doesn't do this area justice at all, and apparently I was losing my light as these pics didn't expose as well as I'd like, but they do place wonderful emphasis on the sky. There was virtually no other traffic on the road. I had everything to myself, at my own pace! Ummm. Don't people warn you about moose and dear collisions at this time of night? Yep, it gives me a bit of pucker factor. Now that you've got me a bit nervous, I'm not going to ride this like a race track, especially with all that construction behind me and who knows what lying ahead. Maybe this is a 'Pro'? The classic lookout shot without other tourists and fences in the way. I had to get a selfie in here as well, but to offset that, I added a couple pics of the wear on the tires. Enjoy! I'm getting smarter in my old age and my chicken strips are in fact "safety zones". My nickname used to be 'Crash' way back in days I had knee sliders and knew how to use them, and tires scrubbed right to the edge. (In my mind they were to the edge. Lol) After a few close calls involving man and wildlife I now opt for a non license threatening pace, and arriving at my final destination upright and intact as opposed to ambulance and or flatbed. I've bad experiences with both. I've got the back aired up to forty pounds and the front up to 38, where I usually run about 36-34 as with a loaded bike and long distance touring, I want a slight crown on the tire so I don't get a horrible flat spot down the center of the tire. So far it's been working well this trip, although there is now visible shoulder wear on the front tire that is visible while looking down from above. Great rubber, these Continental Trail Attack2 tires, and I've full confidence in them for cornering, and braking, although they aren't as good as the Michelin Pilot Road 4s in the wet as I ran last season on the bike, they tend to wear better, and I expect more than 10k off of the rear tire. If shots like this last one are a sign of things to come, I'd better pick up the pace a tad and try to get some kilometres behind me cause I'd be stopping every time I saw a 'Wow!' scene that I'd frame into a photo. Right, so I'm booting along a long stretch of road that is under construction, and as there is no other traffic, I mean I'm really going a bit too fast to see any disasterous potholes, but the Versys loves this kind of riding, and I find I've twisted my wrist a bit too far when I see a dark shape up ahead on the road. Bullwinkle himself with a full rack! Wow! Slow down or try to get your camera out or both? Why both of course, and in the failing light what you will see is horribly blurry and grainy, but I will always remember him as majestic, disdainful and powerful. Velvet springs to mind. Covering his massive rack, and segueing to a beautiful glossy dark coat. Oh bother! Bullwinkle is doing guard duty on the construction equipment! I had to blow this one up so you could see him. No moose here, just a beautiful skyline. Yeah, I might have been going a bit fast. Did I mention I love these tires? In a straight line on gravel, superb, but you have to drop down to about 60kph for corners or you will find yourself in the ditch on this heavy pig of a street machine. It's not an offroad bike, and the term best applied to it IMHO is "SUB". Sport Utility Bike, similar to the ubiquitous SUV driven to shopping malls and found on six lane paved highways. Rule of thumb, if you won't take your honda civic down that road, neither wilt thou goest with the Versys. Roads like these are why people ride bikes. The view and the twisties. Go ride Skyline Drive in Virginia. A look back. Yes, it was that much fun. Every time I've ridden it. I know I'm getting closer to Cheticamp now. As I got closer to Cheticamp, I was running into a few more vehicles, and less desire to stop for shots. Why is it that a phone camera with a crappy sensor takes better shots at times then a dedicated point and shoot? Okay, it's a gps enabled water and shock proof point and shoot with 28mm aperature. I rather like it. If you are an East Coaster, then you probably won't like these next shots as much as the folks back in Onterrible do, as you've been around them all your life. Okey dokey. If you stayed with me thus far, you would know that my next stop should be the Tim Horton's in Cheticamp, then, if I were a normal person, a camping spot, either legitimate or not somewhere close to town, but if you really knew me, you would understand that when I missed the Tim's that I knew had to be ahead up on the left hand side of the road (now where the f did they move it to?!) I'd just keep on riding. And riding. It was now about 2030 or so, and I'd be in total darkness in about fifteen to twenty minutes, but I got in behind a couple of cars and followed them south for ages... Until they turned off, or perhaps I turned off. I had set my GPS to Port Hawkesbury via the shortest distance as opposed to fastest route, as I get like that at times, and I knew that the interior roads in this province are mostly paved and pretty much all of them lead you straight back to the bridge back to the mainland. In this part of the country at any rate. Crap, it had started to spit rain at me, and the one car ahead of me kept going and as my visibility decreased with my pretty much open visor on the Arai XD-R75 (it has really horrible fog and rain characteristics), I had to pull over and don some rain gear over my leather jacket. A bit of a roadside dance for a few minutes. My speed had dropped away to somewhere faster than 60 and slower than 80, and I knew I had to pull off and get a tent set up for the night, cause this was a one way ticket to an accident, with wildlife or one of the 'single vehicle' that I'd never be able to live down should my friends hear of it. As the rain began to abate and fizzle out, I passed a couple of likely spots until I found a Nova Scotian picnic area on the right that looked good, or rather TGTBT at the time, and the ground was rocky and wet. Bog wet in some places, but with a flashlight and time I found a hard spot that while it would take the tent, not the pegs. I was only able to drive in about four stakes, and a couple of those were very iffy, but I made a good choice in tents, and my Alps Mountaineering Lynx 2 is free standing with a buckle on fly, so I spent the rest of the night that included another brief shower in a tent no ten metres from the road where I slept like a baby. Mmmm! Chef Boyardee ravioli with Indian Mutter Paneer curry. Okay, this wasn't cordon bleu, but it was hot and hit the spot before bed, along with plenty of water to wash it down. All for under four dollars. A cranky baby that woke up at 6am. I'm starting to hate camping as I'm up so early in the mornings that at times I don't feel all that well rested, and frankly, I want people to stand a bit upwind of me at the moment. Time for a change after I brush my teeth and make some tea. A short ride and I'm back in civilization and I can order a nice large cuppa and something other than instant oatmeal for breakfast! I'm enjoying this as I sit at the curb and savour the moment. Especially the morning mist that makes me think I'm in the Great Smokey Mountains down in North Carolina. It's cool for a change, and a beautiful morning. That hot sun is going to burn off this mist, and the real day will begin. This gentleman stopped by to chat and was really friendly. He's been around, and worked on Prince Edward Island for a while, but was happy to be back home. He was also proud of his cage and winch set up for hauling moose up into the bed, and let me tell you that cage must have weighed in at over 200lbs easily! Back on the highway, destination Port Hawkesbury. Farewell to Cape Breton Island! I've done highways before, and they all seem much the same, so I opted to return via the Sunrise trail, but I think I missed part of it, but never mind as I found myself on a secondary road headed in the direction I wanted to go, towards Antigonish, which turns out to be the Sunrise Trail. :D Lucky me. I'm running a bit low on gas, down to three bars but I'm not worried, I should be fine for another 100k before I need to start panicking. I rode out to this little dead end jetty where I found this dude packing up from his campsite of the previous evening, and it turns out he's from Onterrible and doing a tour of the East Coast the budget car camping way, and as he'd already been to PEI, all I could do was show him the highlights of Cape Breton on my tourist map, and handed it over to him as he was on his way there that very day. I love chatting with people. You meet such interesting people at home and abroad. Next stop, Cape Breton Island! The view from Monks Head Road. So I totally missed the Monks Head bit, but to make up for it, there was plenty of construction just ahead, and i had to stop long enough to convince the flagman to get a dual sport instead of the cbr250 he was planning on buying. Turns out he was originally from PEI and was working road crew in Nova Scotia because that was where the money was. I'm still on the Sunrise Trail, this time aiming for Cape George Lighthouse, where Rob Harris and Zac had taken me years earlier on the Dawn to Dusk rally. A brilliant little scoot that starts off at O'dark:thirty (Army for stoopid early) until the sun sets, or in some cases with Rob and Zac, until the repair is finished and the bike is able to limp you home. Anyhow, the road was in much better shape, and once I'd passed a couple of cages, I was in sole possession of the blacktop and happy for it to be that way. Once again I don't ride at a license threatening pace anymore, but I was working the bike and maybe wicking it up in the corners just because it felt good to apex and throttle wide on the exit. Fun fun. Things were going great until I saw this roadside gem, a portable saw mill, well semi-portable I suppose, essentially the timber sits or moves on a railway, and a band saw is manoeuvred through it, leaving an almost finished grade of cut. So smooth that one could hand sand it down. I had to stop and ask permission to take some pictures of this for my dad who I know will appreciate it and say "Neato! I wish I had one like that!" or "I've used Charlie's once or twice, and while it is nice, I'd prefer to have a BLANK." Weight is placed on top post cut to prevent the wood from twisting as it dries out. There you go dad, I hope you like these as much as I enjoyed taking them for you. It's not a lasting impression as the sewage truck climbs the hill to service the site, and a couple of other visitors arrive, and as my reverie has been shattered, I don helmet and set my course for Pictou Nova Scotia. I still haven't decided whether it's going to be the bridge or the ferry... Hmmmm. The Versys has turned into a wonderfully sorted touring bike. I have to say that this setup is pretty well sorted for touring. With quick release side racks and a canoe bag holding my tent, I can be ready to tour in minutes as opposed to hours, and it's still a joy to ride through the twisties unlike my Bandit 600s which I had to wrestle in the transitions from left to right and back again. These are pretty easy to get round. I had to stop. The dairy farm makes their own cheddar cheese, and no, it does not come out orange! I had a brief chat with the Cheesemaker, a Scots who had settled from Glasgow to Nova Scotia years ago that his accent was a bit hard to trace. Could have been the UK, might have been South Africa or New Zealand. He told me to have a look in the fridge while he checked the back for some 18 month old cheddar aka "Old cheddar". Cheddar that has aged as opposed to cheddar that has ripened in the plastic while in the transport truck on it's way to your local supermarket. I found that the curd I wanted was going to cost me six dollars, so I wouldn't have enough left for anything else, but when he returned with the sample of old cheddar, he would only take five for it as it had sat there since Friday, and when asked what the rest of my ten dollars (now five) would get, he smiled and handed me a block of the old cheddar and wished me well saying he had to get back inside to add the rennet to the milk. It was just a wonderfully satisfying experience that made me happy I was on a bike in that place at that moment with some lovely cheese to share when I got home later that day. Now I'm back out on the highway heading in towards Pictou NS when I decide that it's early enough in the day that I'm going to the Lobster Trap via the ferry. Prince Edward Island is called the lobster trap, as once you climb in you can't climb back out unless you pay your dues. Bridge and Ferry is free one way, to the Island. You have to pay to get off. While waiting for the ferry I met the nicest couple from Brampton Onterrible, Paul and Viv. They'd been riding for a while and had just done the Cabot Trail and were on their way to ride PEI for a couple of days, and we talked so much that I didn't even really appreciate the ferry ride. lol. One thing I've learned about ferries, bring your own strap if you plan on taking them over and over. Anyhow, it was early in the afternoon, and I'd be home by supper, so I offered to take them up to Cape Bear Lighthouse where they could add the "Red cliffs" to their list of "been there, done that" so we set off up the road, only to find that they had finally gotten around to moving the lighthouse and while wonderful, my carefully framed shot of the quintessential lighthouse was no more. We headed back into Cornwall where I left them at Cows enjoying a ice cream cone before check-in at their hotel. Life is pretty good when you meet such wonderful people while on two wheels. Welcome back to the Island Ron! Ooh! Remember I spoke about farm equipment? I opted not to pass this one until he cleared the brow of the hill and I could see further past him.